Can I buy just a proofread? Based on our experience working with hundreds of authors, we’ve found that performing only a proofread—a final edit once the manuscript has been laid out—results in a lengthy list of revisions, which can be costly and time-consuming to implement. For this reason, we combine our proofread service with a copyediting round to ensure the manuscript is as clean as possible once laid out. Yes—if you’ll be doing editing. While other programs have similar features, Microsoft Word is the only program that offers the full benefits of the Track Changes program used by our editorial team. If you’re going through the editing process, you’ll want to make sure you have access to Microsoft Word. What’s the difference between a copyedit and a proofread? A copyedit takes place early in the publishing process, while your manuscript is still a Microsoft Word document. This will be your editor’s first opportunity to review the manuscript and make any necessary corrections. The proofread, a final review for any remaining glitches or inconsistencies, takes place once the manuscript has been laid out. If you have an editing level that includes content editing, your assigned editor will offer developmental suggestions and queries to improve the clarity, arc, and soundness of your book’s argument (in the case of nonfiction); and the characterization, dialogue, and plot development (in the case of fiction). Do I get to choose my editor? Our editorial team will assign the best editor for your manuscript based on a number of factors, including the editor’s areas of expertise and availability. All our editors have been thoroughly vetted and have years of experience working on book-length projects. We promise you’ll be in very good hands. Will my editor review my changes to the manuscript? If you have a multiple-round edit (Basic Plus, Comprehensive, or Publish Prep), your editor will review your revisions as part of the subsequent round(s) of editing. However, after the final round of editing, you have the final say, not the editor. With a Basic Copyedit, your editor will review the manuscript only the one time. Can my editor accept/reject changes for me? No. To ensure the finished book includes only the text that you, the author, intend to be there, you must accept or reject your editor’s proposed changes. CMYK is an abbreviation for Cyan, Magenta, Yellow, and BlacK. These are the ink colors used in 4-color printing, and differ from RGB colors, which are typically used for on-screen viewing. All documents destined for print use need to be submitted in CMYK, so that the printers can properly recognize all parts of your print-ready file. Leaving the colors as RGB can cause variance, drastically lowering the quality, accuracy, and consistency of the printed product. What’s the difference between flat black and 4-color-black? 4-color black is made of a mixture of cyan, magenta, yellow, and black that looks deep and crisp and visually appealing. Flat black is made of 100% black (as a CMYK Value: C = 0%, M = 0%, Y = 0%, K = 100%). Flat black is requested for all text within a book, as well as barcode images. This ensures that there will be no registration issues in your book’s interior or barcode. Documents are printed on larger sheets of paper, then trimmed to meet your trim size. 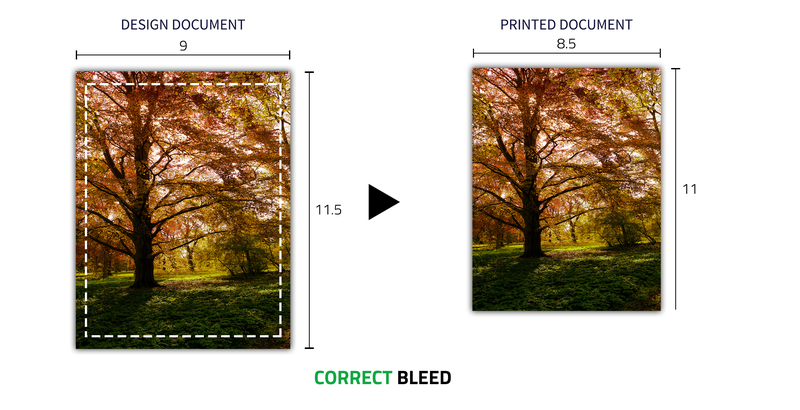 A “bleed” is the excess printed area that’s trimmed off a full-bleed image (or, an image that takes up the entire page.) Without bleed, there could be a fine, white edge left after trimming. Why can’t I talk directly with my designer? The design department spends most of their time designing your books—but that doesn’t mean we don’t communicate with our authors! We have two types of cover design services. One includes a 30-minute phone consultation with the designer creating your cover. The other is our standard service. Even with our standard service, your messages, sent through the message center, will always reach your designer—as well as your Author Coordinator. The best way to communicate with your designer, however, is through revisions worded as clear directives. This tells your designer exactly what you would like to happen with your book. A revision is any individual change to your book’s files. This includes formatting changes, editorial revisions, and correcting errors. They should all be entered into our system, within individual revision fields, worded as clear directives for your designer. Can I get a Word document of my fully formatted manuscript? Unfortunately, no. As soon as we start laying out your manuscript in InDesign, it stops existing as a Word document. We can, however, provide you with your fully packaged source files or a PDF of your interior. Why do I have to pay for additional revisions? Each package comes with a set number of revisions. Most authors will be able to get through both cover design and interior layout within the revisions allotted, or with just a few additional minor revisions (which we’re often happy to waive). It’s especially important for your manuscript to be clean, with proper formatting tags, and scoured for typographic and editorial errors prior to interior layout to avoid paying additional revision fees. Why does my manuscript need formatting tags? Why is my interior taking so long? It’ll typically take about 15 business days (or approximately three weeks) to receive your interior back from your designer. We hand format every single book, line-by-line, and because we don’t automate formatting or use templates, each interior is crafted to fit your specific book’s content and style. This takes time but ultimately creates a better, more polished book. Why don't ebooks have page numbers? Because ebooks are read on ereaders, where people can change the font, font size, line spacing, and even margins of most books, ebooks have to be specifically formatted so they adjust to whatever setting the reader wants. That means it’s impossible to have page numbers—the numbers would have to change for every person! Instead of page numbers, ebooks use locations. What’s the difference between ebook formatting and ebook distribution? Ebook formatting means we convert your print book files into four ebook formats (MOBI and three device-optimized EPUBs) so your ebook can be purchased and viewed on all major ebook devices. With distribution, your ebook is listed for sale through Amazon.com, iBookstore, and 120+ online retailers including Barnes and Noble, Kobo, Copia, and eBooks.com. If you purchase ebook distribution with us, you’ll receive library distribution, too. Why doesn’t my ebook look exactly like my print book? Because of the way ereaders display content, your ebook will never be a mirror image of your print book. Different ereading devices allow users to personalize their reading experiences. This means that users can choose different font sizes and styles. Other factors that affect the look of your ebook include screen size and the display technology used by each device. Why does my PDF need to be converted? Even though your PDF is an electronic file, the layout and style is fixed. For most books to display properly on an ereader or electronic device, they need to have a flexible, or fluid, layout. For this reason, your fixed-layout PDF needs to be converted into a fluid-layout MOBI or EPUB format. Ebook formatting is the process of taking the raw text of your ebook and using computer code to make everything display in a way that’s recognized by ereaders. Every formatting feature in your ebook is created using this code, which then translates to the layout seen on your ereading device. This process is similar to building a website, which is why we do all of our formatting by hand. When does ebook formatting start and how long does the process take? We assess your files to make sure that we don't need anything else from you. If we don't, we'll start on your sample chapter, which you’ll get to approve after five business days, then the formatting, which takes 12 business days (a little less than three weeks). If you spot any revisions you'd like to make, we’ll format those within five business days (or approximately a week) of their submission. We estimate about six to eight weeks for this whole process. MOBI and EPUB refer to an ebook’s file type. Think PDF vs. DOC or JPG vs. GIF. Each ereader recognizes a different file type. Amazon’s Kindle reads MOBI files, while the iPad, Nook, and most other ereaders recognize an EPUB file. We format your ebook for both file types, so all your bases are covered. Not everyone uses a device, like a Kindle or a Nook, to read their ebooks. You can download software to your computer that’s capable of reading ebook files, much the same way you download Adobe Acrobat Reader to open PDFs on your computer. Some people opt to read on their laptops using a software ereader rather than buying a separate device. Microsoft eReader and eReader Pro are just a couple examples of the software ereaders you will find. Many major brands, such as Barnes & Noble and Amazon, also offer software ereader programs. Do I get to see my ebook before you distribute it? Absolutely! After we format your ebook, you’ll get to see it and even upload it to your ereader before we begin distribution (or provide you with the final file, if you're doing your own distribution). If you see anything that needs to be changed, you'll be able to let us know. As the author, you’re in charge! You’ll get to review the ebook file after we format it, because we want (and need) you to be involved in the process. We'll provide you with detailed instructions on how to submit revisions when we get to that stage. Why do editorial revisions require so much time and money? When you submit your manuscript or print file for formatting, we work under the assumption that you’ve handed us the final version of your book, and that no additional changes will be needed. When we build your ebook, we extract the text from your original manuscript and build your file from the ground up, using ebook-specific HTML and your submitted document as a guide. If text needs to be changed after this point, it requires us to go into the source code of the ebook, make the adjustment, then close your files back up. We don’t see words on a page, like you do; instead, we see long lines of code that correspond with how your book will look on an ereader. Making unexpected changes takes a bit longer than the initial format, and the changes will incur an additional charge for the extra time and work required of the formatter. Should I use social media to promote my book? While we believe social media can be a beneficial strategy to spread awareness of your book, it’s not for all authors. Promoting your book on social media requires a strong strategy, ongoing interaction that doesn’t only relate to your book, and honestly, a good deal of time. If you can’t dedicate the time to interact on a consistent basis, simply having pages up can be more detrimental than beneficial. When people visit a Facebook page or Twitter profile that has little or no activity, they’ll see little benefit in connecting. Is marketing included in my publishing plan? We offer several marketing services for you to purchase a la carte, including a marketing consultation with our book publicist. The Marketing portion of our Author Learning Center also offers many tips on marketing your book on your own. What is the difference between sales (distribution) and marketing (publicity)? Marketing is concerned with getting attention for your book in the media or getting your book in front of your target reader. Sales and distribution are concerned with the actual sales and online listings of your book. When does the marketing department start working on my book? Depending on the type of marketing you purchase, promotions can begin at different times in the publishing process. For example, website, Facebook page, and Twitter profile creation can begin as soon as your book cover has been designed. These marketing activities are best suited to start before your book is published so you can begin building a following for your release. Other services, such as Amazon Exposure and Goodreads, begin after your book has been published. For these activities, your book has to be listed on Amazon and Goodreads, which doesn’t happen until after your publication date. If you’re doing a marketing outreach campaign, preparations will begin after your book files have been approved. Your books must then be printed before we can send out review copies to media outlets. This type of campaign requires you to set your publication date out two to three months further than you might normally do. Can I do anything to market my book if it has already been published for a while? You need to start marketing your book before it’s been published and shortly following publication, but there are some activities you can do after the fact. If your book has been out for a while, promoting it on Goodreads with giveaways or an advertising campaign can draw attention to your book (often a good deal!). Like Goodreads, Facebook advertising can be another way to promote your book. If you’re going to advertise on Facebook, make sure you’re active on Facebook to encourage people to like your page. If they click your ad and end up on an inactive page, they probably won’t take action (i.e. like your page).Visit our services page to learn more about our Goodreads and Facebook Advertising services. What if I plan to get endorsements? Great! If you’d like to include endorsements you’ll want to make sure you secure them before you start book production. Since your endorsements will either go on the cover of your book (front or back) or in its interior, you want to have them before these processes start. If you get them after your cover and interior have been finished, you can add them to your website or marketing materials. How do I get a newspaper, magazine, or blog to review my book? The best way to do this is to hire a publicist to pitch your book to do it for you. While you can do it yourself, most media contacts would prefer working with a publicist rather than directly with an author. After all, while you would be starting from scratch, a good publicist will already have a strong network of contacts and know who’s interested in which books. Plus, since the publicist is less emotionally involved in the book, he or she will know how to best approach the media while being just the right amount of pushy. Trust us: This is one part of the process you won’t want to DIY if you don’t have to. Why does the distributor need a copy of my marketing plan? One of the benefits of participating in Expanded Distribution is that your book will be presented to buyers at Barnes & Noble Small Press. Along with your book, we provide them with a copy of your marketing plan, which we have you fill out. The marketing plan is important for these buyers because in addition to deciding if your book’s subject matter is unique and your cover design is enticing, they want to see what you, as the author, are doing to promote your book. The more marketing you can set up in advance (e.g. website, launch party, and book signings), the better your chances are of being picked up. Buyers want to see a detailed marketing plan because carrying a new book is a risk. If they receive a plan that is vague (e.g. “I plan to have signings”) or blank, they may assume the author either doesn’t have any promotion plans or just hopes to do something. When they see a plan with detailed plans (e.g. “I have a launch party scheduled at [local bookstore] on my publication date in November”) they’re more likely to consider a book for the shelves. Should I respond to someone who reviews my book? You should never respond to a bad review. If you’d like to respond to a positive review, however, that’s ultimately up to you. Reviewers fall into two camps: those who love hearing from an author and those who feel reviews are for other readers and that authors don’t belong in that space. To make a more informed decision, you can read our in-depth article on responding to reviews. Is book marketing different for fiction and nonfiction books? Typically, yes. For the most part, fiction and nonfiction books have two different purposes—one to entertain and one to educate. Two purposes means two separate types of audiences, and how you approach them will—and should—be different. To learn more, visit our blog on promoting your book with media outreach. Do you set up book signings for authors? We can’t help authors set up book signings, but only because we work with authors from all over the country. It’s best to set up a signing in your local community, so either approaching local locations (e.g. bookstores, coffee shops, library) on your own or with the help of a local publicist is the way to go. Where will the email sent to my website domain go? Sometimes authors like to purchase an email address along with their website domain. For example, AUTHOR-NAME@websitedomain.com. If you purchase our author website service and choose to use our website hosting service, your domain email will NOT be affected. You will still receive your email the same way you always have. All the sales activity for your book will be available for you to access through your PubSmart account at any time once the book is published and released. When your royalties reach $25, the payments will be distributed to you monthly for print publications, quarterly for ebook publications. 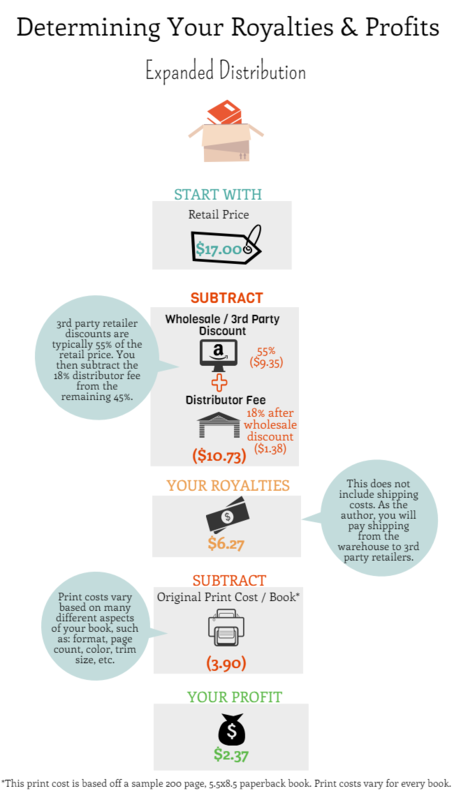 If you give 100% of the royalties to authors, how do I know how much I’m earning from each book sale? 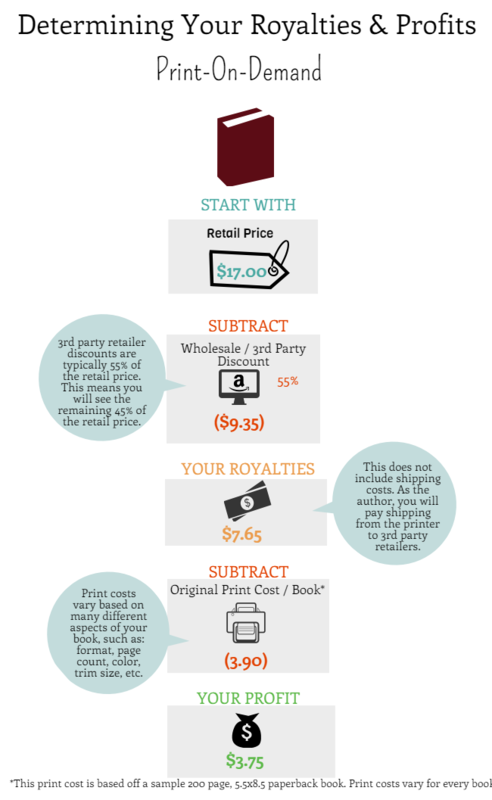 What you earn on each book sale depends on which distribution model you made the sale through. Here are examples for direct-to-reader, print-on-demand, and expanded distribution models. What’s the difference between a direct-to-reader sales page and distribution? Direct-to-reader sales page refers to processing orders through your website. 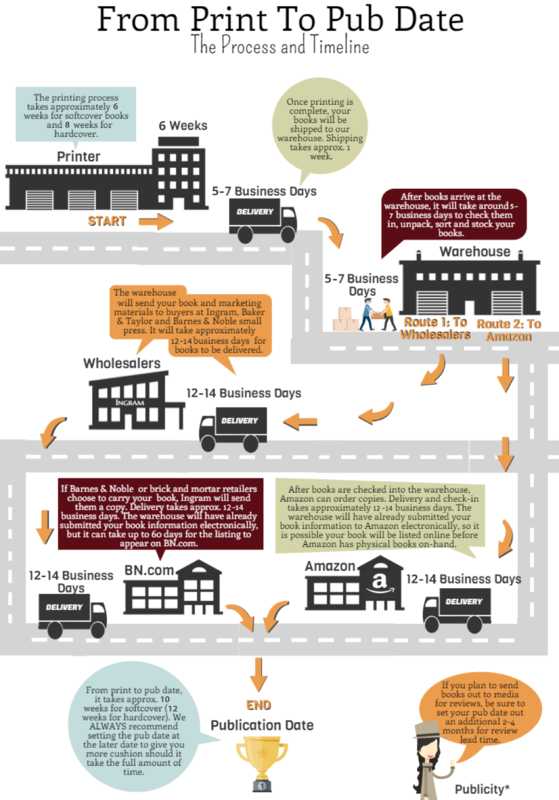 Distribution refers to orders processed for a book through a third-party retailer or wholesaler such as Amazon, Barnes and Noble, Ingram, or Baker and Taylor. Do I get the customer information (e.g., email or state) from sales made through my direct-to-reader sales page? We’re only allowed to share the customer's information if they provide consent during their sales transaction. If the customer chooses not to share that information, we cannot disclose it. There’s no way to “force” the customer to give us that information if they don’t want to (i.e. we cannot deny them the book sale). If you want to connect with your readers, consider setting up a Facebook or Goodreads account. What’s the difference between print-on-demand (POD) distribution and expanded distribution? POD distribution is the best choice for authors primarily concerned with being able to sell their book with online retailers, such as Amazon and B&N.com. Expanded distribution is a great fit if you want to try to get your book into brick-and-mortar locations (e.g, bookstores and libraries) in addition to selling it through online retailers. Can I do both POD and Expanded Distribution at the same time? No. POD and Expanded Distribution are different types of distribution, so you have to choose one or the other. For the differences between POD and Expanded Distribution, check out our resource for determining the right model of distribution for you. Can I switch to Expanded Distribution if I start out in POD? While you can technically switch distribution models, practically speaking, it’s much cheaper and better for your book’s publishing continuity to stay with one distribution model from the beginning of the process. How will Expanded Distribution and POD Distribution affect my publishing timeline? Expanded Distribution has a different publishing timetable than POD distribution and involves more involvement from our distributor. For more information, see our publishing timetable. How is ebook distribution affected by the type of physical distribution I have? It’s not. We distribute ebooks directly to Amazon.com, Apple’s iBookstore, BN.com, and 120+ other retailers and wholesalers. Why aren’t my books for sale with third-party retailers after they’ve finished printing? If you’re using print-on-demand to print your books, they will be! With POD, your books are printed as they’re ordered, so they’re always listed as “in-stock.” With Expanded Distribution, after your books are printed, they need to be transported (distributed) to the distribution warehouse, where they’ll be checked in and stocked. After that, the distributor sends books to Amazon, Ingram, and Baker & Taylor (where they can then be sent to Barnes & Noble). All of this takes time, which is why we set your publication date weeks out from when your books go to print. Your publication date is the day your book is available for purchase by readers. On some sites like Amazon—or even your direct-to-reader sales page—your book might be listed as available for pre-order, but this is different from your publication date. This just means that once your publication date arrives, all books that’ve been pre-ordered will be sent to readers who have ordered your book. Yes. When all your books specs (e.g., trim size, page count) have been determined, you’ll be provided with quotes that’ll let you know the price per book, based on the size of your print order. What’s the turnaround time for printing books? The turnaround varies based on your book’s specs and what kind of printer you’re using. To find out your timeline, view our printing timeline resource in the Author Learning Center. 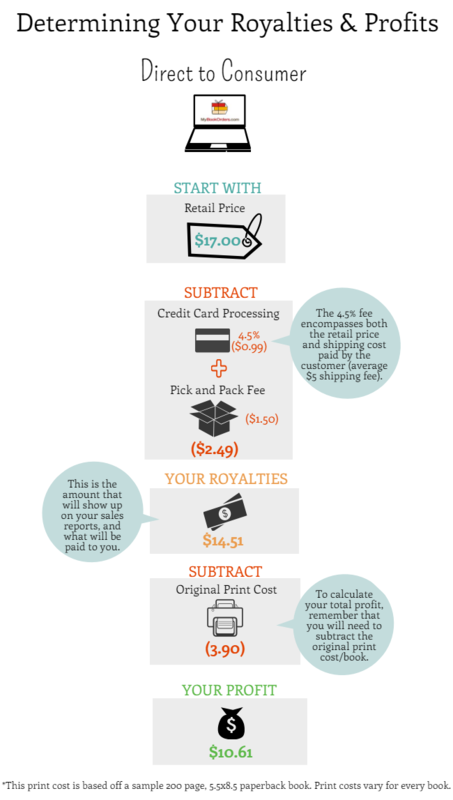 The differences between digital and offset printing are quality, quantity, and printing costs. Offset printing has a different printing method, offering higher quality ink for both color and black and white interiors. It also offers speciality features, such as spot finishes, foils, or embossing, whereas digital printing doesn’t. Offset printing costs more to set up, but has a better per-book cost when you a print large volume (500 books or more). Need more information? Check out our resource, What Type of Printing Is Right for Me? Will my reprint orders print faster than my first order? Unfortunately, no. Though you may skip the proof stage, the actual printing timeline is the same. Because the printing timeline is based solely on your book’s specs, the printing timeline remains the same. For this reason, it’s a good idea to keep an eye on your inventory, so you can place a reprint order before you run out of books! When you receive your physical proof in the mail, you may be surprised to discover that it doesn’t look like a finished book. Most of our printers create what are called “unbound proofs.” These proofs are your final opportunity to review your book for spelling errors or pages out of order before the full print run. Although a proof represents the layout and format or your book, it’s not an exact representation of what the final book will look like when fully bound. “Overs” are overrun copies of a book produced during a print run with an offset printer. In offset printing, it’s industry standard to have +/- 10% variability in the final number of books printed, compared to the number of books ordered. Since large rolls of paper are used for printing before folding, trimming, and binding, they have to do a materials estimation (since the printer may have to run calibration on the press before the printing comes out just right). The press can't be stopped at a certain number of copies—it runs through the materials. This, along with the amount of calibration needed, can either create a surplus or shortage of books, not to exceed +/- 10% of the quantity ordered. If I have expanded distribution or a direct-to-reader sales page, how will I know if I should print more books for the distributor to use so I don’t run out of books to sell? In your PubSmart account, you can monitor the inventory levels for your book so you know when it’s time to order more. You can also have your account send you an email notification when your inventory gets to a certain level (e.g.,. 25 copies of the book).